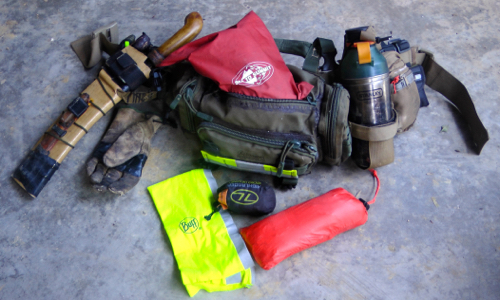 One piece of kit I carry on my EDC (Every Day Carry) belt is such a simple and basic item and yet it is something that solves that important problem of how to carry more water when you have a cut-down EDC setup that doesn’t include large water bladders or extra water bottles. This item is the Maxpedition Rollypolly dump bag and, in the video below, is a quick review of it and a demonstration of how it can be used to carry an extra 3 litres of water. The key to enjoying yourself in the wilderness is to get comfortable there and that can mean different things in different parts of the world. If you’re up at the North pole then keeping warm is the main factor, if you’re in the desert it’s about staying cool and finding shade, but in the tropical jungles there are a number of factors that will determine whether you can stay comfortable of not. Most of the discomforts in the jungle are not going to kill you directly (whereas at the North pole hypothermia can, as can dehydration in the desert) but over the last decade or so I’ve come across a number of people who have simply become so overwhelmingly uncomfortable on a jungle trek that they stop thinking straight and effectively start to panic…and that can kill you. A key factor that influences whether you get this sort of ‘jungle-overload’ or not is your own attitude towards the discomforts that are there – by that I don’t mean being ridiculously positive about everything but rather accepting the odd period of discomfort with good humour. Nor do I mean being stubbornly stoic about discomfort and doing nothing about it – whenever possible you should do what you can to reduce that discomfort as everyone has a breaking point and if you get too hot, or too cold or get one too many insect bites or too tired then it’ll happen to you too. This just doesn’t only apply to camping but also emergency situations too. Endurance isn’t a skill, survival is. On bad days in the jungle when the going has been a bit rough the thing that helps me to shrug it off is the thought that by late afternoon I’ll have my hammock and tarp up and I will be dry and comfortable. In other words the discomfort is only temporary. Which brings me to the the topic of this post which was to develop a hyper-light blanket / emergency blanket for use in the jungle. You might think it is unnecessary to have a blanket in the jungle but people are often surprised by how chilly it can get at night and it’s hard to sleep well when you’re feeling cold. Also our bodies don’t react well to the sudden drop in temperature from the heat of the day to the chill of the night and we can fall ill as a result. But that’s not the only benefit of a blanket. It also functions as a cover between you and the insects that may have decided to irritate you to the point of distraction or who are intent on sucking your blood. Space blankets aren’t ideal for this purpose: they’re made from Mylar and it doesn’t breathe which means that if you start sweating that sweat has nowhere to go. It’s also difficult to keep yourself fully covered by one of these blankets if you’re in a hammock as it keeps riding up or shifting out of position…and if you do manage to fully wrap yourself up it in then you’re going to sweat. You might think that that you could simply use leaves and certainly if there are large leaves around (like banana leaves) you could use them and you could also weave yourself a blanket with palm fronds. But it’s more likely than the leaves you’ll find are the ones on the forest floor – normal sized tree leaves – and how do you get those to form a blanket? The emergency blanket I’ve made for jungle use tries to get round some of these issues – for hot nights the parachute material will be enough to keep me warm on it’s own, if it’s a bit cooler I can insert the squares of Mylar into a quilt like section that covers my upper body (your legs are fine without extra warmth) and if it’s really chilly I can fill the entire upper section of the blanket with leaves to make it really warm. It’s also small and light (just 150 grams). So this design of emergency blanket has the benefit of being flexible and adjustable depending on the conditions, and being flexible is another key factor in the jungle as it’s such a variable place both in terms of climate and terrain. Another example is the hammock vs tent debate, in the jungle at least the hammock is the more flexible of the two allowing you to camp anywhere where there are two trees (and there are plenty of trees in the jungle) whereas tents need flat ground, preferably without uncomfortable roots beneath and require you to clear the area where you’re going to pitch it. Being flexible in the wilderness also applies to planning your trip – do you really need to cover 30 km in three days? That’s going to mean you’re really pushing it and any unforeseen obstacles are going to mess up your timings and force you to rush…and being in a rush in never a good idea in the jungle. Why not just cover half the distance instead? Or take a day to two extra to do the full distance? Either way you’re be less rushed and you’ll be able to be more flexible about when and where you camp. Another example is pack weight – do you really need to take in a 25 kg pack for a two night trip when others can manage just as well with a 10 kg pack? Flexibility can mean making do with less and allow you to travel lighter. Being flexible, putting up with periods of discomfort with good humour and doing everything you can to make yourself as comfortable as possible are key to enjoying your trip into the jungle. If your fire fails to catch it is aggravating enough, but if you had to work hard to get an ember in the first place (using friction fire for example) ….well then it’s truly infuriating. In the jungle, fire-lighting is almost always a challenge as the materials you are using are usually damp and you may even have to start a fire in the rain. Dry tinder is hard to find and knowing how to make your own is a useful skill to have. Similarly, using a good fire-lay makes an enormous difference to how well your fire will burn (and thus how well it can withstand any light rain or drizzle). In this video I look at how to do this using bamboo (easy) and wood (harder) with the assumption that you have no good tinder (eg palm fibres, dry grass etc) to hand. 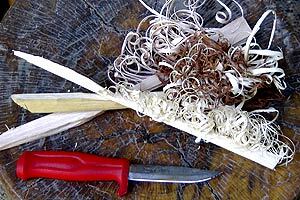 Feather sticks: The thing to remember with feather sticks is to use a sharp knife and avoid any knots in the wood. They aren’t difficult to do and all it requires is an hour or so of practice to master them. Don’t be put off if your feather sticks don’t look like the works of art that some people like to produce – at the end of the day it only needs to be as good as it needs to be to light your fire. 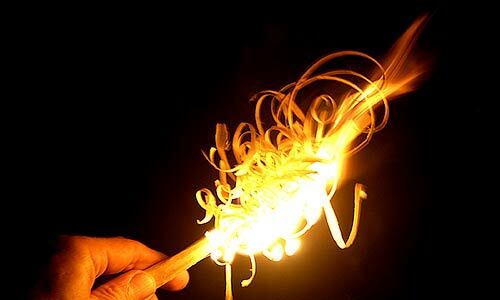 Saying that, lighting a feather stick with charcloth or a spark-rod will require one with fine/thin curls rather than thick ones….but, once you get the hang of it, they aren’t difficult to make either. If you angle your knife to the left or right (i.e. with either the tip of the knife or the handle of the knife angled down) you will see that the curls twist off to one side or the other – this is useful when carving down the sides of the feather stick to make sure your feathers pack together well. Also, as you carve down the stick look for the new ridges that are formed – these are the lines to follow to produce the subsequent curl. …but before you start, sharpen your knife! Using the parang to make feather sticks is easiest with a two hand grip – but this means that you need to support the stick at both ends. You can jam a long stick into the ground, rest the other end on your shoulder and carve down, but I prefer to draw the parang towards me instead. If you are using the ‘draw-method’, jam one end of (a shorter) stick into the ground and support the other end with your stomach (I usually jam it into by belt buckle). Time spent preparing fire materials before you try and light them will always save you a lot of time, effort and aggravation later on.